How to Install Android 6.0 Marshmallow and When will Your Smartphone Get it? Google is eager to release the latest version of its mobile operating system, Android 6.0 Marshmallow, to some of its Smartphone and Tablet lineup. The latest Android 6.0 Marshmallow update brings a whole host of new features, including Doze mode, App permissions, Google Now on Tap, "Do not disturb" setting, and easier volume controls, among other features. Read: You can check out the key new features of Android 6.0 Marshmallow here. Along with the newly launched Nexus 5X and Nexus 6P, Google is also releasing its latest Android 6.0 Marshmallow update for its existing Nexus devices – Nexus 5, Nexus 6, Nexus 7 (2013), Nexus 9 and Nexus Player – starting today. But, When will Your Smartphone Get Android 6.0 Marshmallow? Google Nexus devices are the first ones to get Android 6.0 Marshmallow. Motorola also confirmed Friday to issue Android 6.0 Marshmallow software updates for a number of its smartphones. HTC has confirmed to issue the new Google Android operating system to its HTC One M9 and HTC One M8 at the "beginning end of 2015". Update to Samsung handsets often takes a while to arrive than its actual announcement. Last time, Samsung confirmed to roll out its new version 31 days after the Google launch, but users saw quite a delay. LG was very quick in rolling out Android Lollipop update last year. The official release date of Lollipop was 3 November 2014, which was followed by an LG Lollipop update on 10 November 2014. However, LG has yet to confirm its plans for upgrading to Android Marshmallow 6.0, but users can expect to get the new Android operating system in LG G4 and LG G3. Huawei is little slower than other phone manufacturers to update its devices, but it might change this nature with the launch of a Huawei Nexus 6P handset. Huawei is making the Nexus 6P, so we can expect to see Android Marshmallow 6.0 coming to other devices it makes, including the new Mate S quicker. Last time, Sony took only a few months to roll out then-latest Lollipop update. 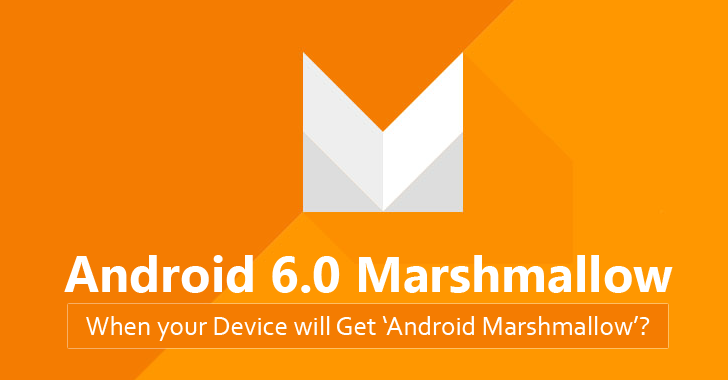 So, you can expect to get the Android 6.0 Marshmallow update soon. Getting Marshmallow to your devices also depends on your handsets. So, if you have a high-end device from a well-known manufacturer like Samsung, HTC, or Sony, you can expect to get the upgrade until late 2015 or early 2016. If you are currently running Android 5.1.1 Lollipop, you may get an upgrade to Android Marshmallow soon. But, if you are on KitKat or older version of Android operating system, don't count your chickens. These devices will continue to receive critical security updates, but will remain on Android Lollipop 5.1.1. So, in short you'll have to wait for Android Marshmallow until your device receives upgrade. But, if you own a Nexus 5, Nexus 6, Nexus 9 or Nexus Player and are desperate to get a look at what's in store from the new Android M, you can install the Developer Preview. First, create a backup of your data because installing the developer preview will wipe your entire device. To create a backup, head on to Settings –> Backup & Reset –> Backup my data. Before you tick Back up my data, make sure you have already set up the backup account. Step 1: On a Windows PC, Download and install the ADB Tools and Fastboot. Step 2: Download the appropriate Android M installer for your respective device: Nexus 5, Nexus 6, Nexus 9, Nexus Player, which you'll find on the Android Developer's site. Step 3: Turn off your Nexus device, and then restart it to the bootloader by pressing and holding power and volume down buttons. Step 4: Connect your Nexus device to your PC; head on to the ADB Tools folder; and open flash-all.bat file. Step 5: Once the process is completed, your Nexus device will be rebooted and started running on Android 6.0 Marshmallow preview. Now, for restoring your backup and settings, head on to Settings –> Backup & reset –> Automatic Restore. If you don't like Android M, you can uninstall it and revert to your previous Android operating system by simply removing the files from Minimal ADB and Fastboot, then downloading the appropriate system image and repeat the instructions above.